Cornwall is one of the first counties in the UK to see the signs of spring (and they make a big deal of it, too, see the Spring Story). So when the sun came out after a frankly dismal winter spent mostly in wellies, I grabbed a pair of walking shoes, camera and the dog, and headed for Trebah Garden, with a view to finding some chemistry among the early blooms. 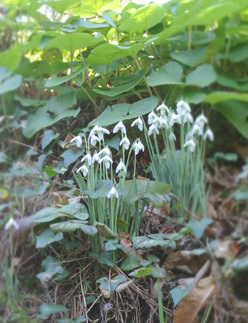 And we were not disappointed, spotting one of the sources of a compound to treat the early stages of Alzheimer’s disease almost immediately: Galanthus nivalis and related cultivars, commonly known as the snowdrop. In fact, galanthamine (and you will also see the related spelling “galantamine”) can be found in many members of the Amaryllidaceae family, with daffodils another contender. Our colleagues over at Molecule of the Month have done a post on this compound where you can see its structure. 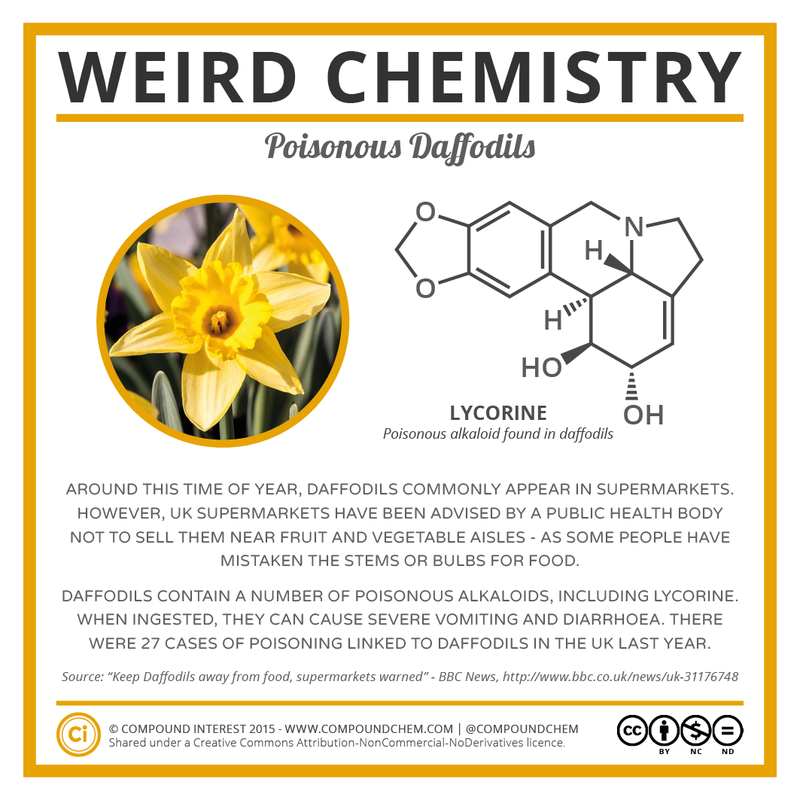 When Public Health England issued guidelines about the positioning of cut daffodils so they would not be mistaken for food, Compound Interest did this infographic under the #WeirdChemistry tag. 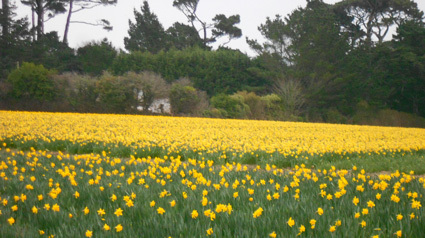 In fact, daffodils, which continue to be grown for the cut flower market in this neck of the woods, have been considered as a commercial source of galanthamine, as well as other compounds, as explored in this Chemistry & Industry article from 2011 (Drugs from Daffodils, M. Jones, J. Pulman and T. Walker, C&I, Feb. 2011). The discovery and development of galanthamine, as well as its likely action in the body, have been reviewed (M. Heinrich, H. L. Teoh, J. Ethnopharmacol. 2oo4, 92, 147-162), and more recently the testing of multiple daffodil cultivars for pharmaceutically active compounds has been described (L. Torras-Claveria, S. Berkov, S. Codina, F. Viladomat, J. Bastida, Ind. Crops Prod. 2013, 43, 237-244). 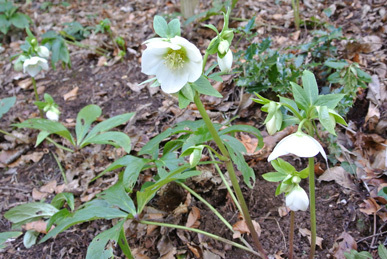 While I had heard about the link between these bulbs and treatment for Alzheimer’s disease before, it was news to me that hellebores, Helleborus spp., also contain compounds of potential interest to the pharmaceutical industry (reviewed in M. C. Maior, C. Dobrotă, Cent. Eur. J. 2013, 8, 272-285). Perhaps, since these garden plants come with warning labels about their toxicity, this should not have come as a surprise. The most interesting compounds found are a family of cardioactive glycosides, which, as the name suggests, contain sugar molecules bound to other functional molecules and affect the heart. Some of these compounds, e.g. hellebrin and hellebrigenin, are named after the plants. 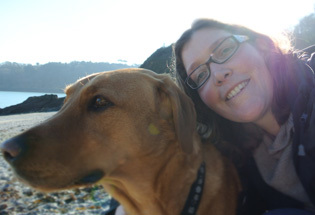 Having by now covered a whole 100 metres of the path, the dog was getting increasingly impatient with my frequent stops to take photos, so we only managed a quick shot of the tree ferns before continuing an increasingly urgent walk to the bottom of the valley as she had scented the beach. 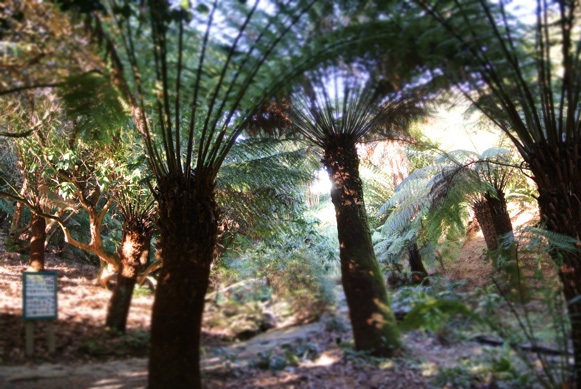 Tree ferns come mostly from the southern hemisphere and like sheltered, humid and shaded positions. My guess is that we were looking at Dicksonia antarctica, which is frost hardy and seems to thrive in Cornwall with its maritime climate and limited frosts. The gardens at Trebah are further sheltered by lying in a valley leading down to the Helford River, and, as you can see, the tree ferns are looking rather good. 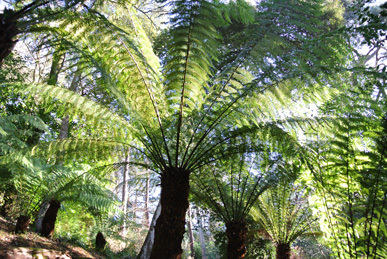 As mentioned in an earlier post on the Bristol Botanic Garden, tree ferns are related to ancient species and may well contribute to the fossil fuel stores our modern life relies on. In addition, ferns can be phytoremediators, the topic of another post, and tree ferns have been used to remove copper ions from waste water, albeit by sorption on the dried plant material (Y.-H. Ho, Water Res. 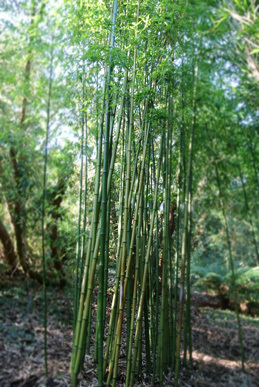 2003, 37, 2323-2330), rather than by growing them on contaminated land. The team. One of whom would not hold still for photos. Which is why the other one looks a little strained. Having thus expended some energy, we were able to return to the garden and start to walk back up the valley. 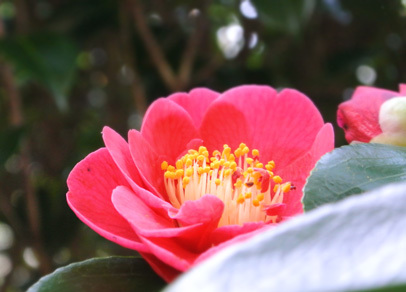 I had spied the early blooms of camellia, most likely Camellia japonica, in some plants along the way, but before heading home I was determined to get some close-up photos of them as well. Trebah has a Camellia Walk, which seemed a good place to start. 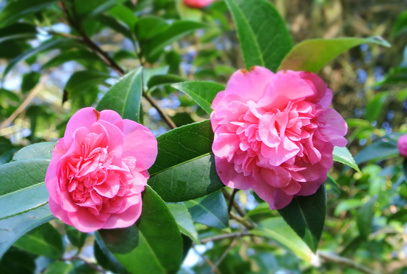 Again, camellias tend to thrive in the milder climate of Cornwall, and they also benefit from acidic, humus rich soil as present in this wooded valley. Most of the shrubs were heavy with flower buds, but few had actually opened this early in the year. Nevertheless, we found a few and despite the competition of good smells on the ground vs. flowers above head height, we managed to take some pretty photos. Contributor: Natalie Fey. Inhibitor: Molly the orange Labrador. Categories: Cookery, General, Plants, Spring, sugar | Tags: biochemistry, chemistry, fuel, galanthamine, hellebrin, medicine, Molly the orange Labrador, pharmaceutical, phytoremediation, science, sugar, tea | Permalink.